I would probably read any book written by Lucy Lippard–even if it was about something that interested me as little as defensive driving or how to get stains out with vinegar. I have long admired her original mind. Lippard emerged as a thinker in the early feminist art scene, but her book which has influenced me the most is OVERLAY, which is comparison of prehistoric art and contemporary, mostly earthwork based, art. 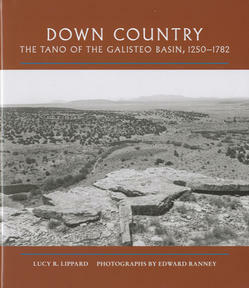 So I was very excited to find that she was writing about something close to home–the Galisteo Basin, its pueblos, and history–in her newest book DOWN COUNTRY: The Tano of the Galisteo Basin, 1250-1782, from the Museum of New Mexico Press. Lippard’s writing is never limited to either the intellectual or the intuitive–rather it seems to inhabit a heightened sense of awareness between the two. This book is far from random, but rather reflects the author’s love–even obsession–with the ruins of the Galisteo Basin. This is Lippard’s home, and earth she has walked daily for many years. Still, it remains a mysterious place, open to inquiry. On the scholarly level, the book looks at the history of the Tano, or Southern Tewa, people who lived for several centuries in the Galisteo Basin. The area is rich with deserted pueblos and some of the most spectacular rock art in New Mexico. But it remains somehow off the map even for those tracking archeology. Who were these people and how did they live? Lippard manages to synthesize several world views here, including archeologist Alfonso Ortiz, art historian J.J. Brody, Pueblo historian Rina Swentzell, as well as a host of scholars and contemporary Native opinions. Rather than finding world views antithetical, Lippard has the knack of layering ideas so they don’t exclude each other. The Tano arrived, built, farmed, flourished, and then were prey to an unending series of destructive influences, from drought to the Spanish conquest to Comanche raids. Survivors may have eventually emigrated to Hopi or Rio Grande Pueblos, and what is left behind is a history in stone. Lippard never says so overtly, but how people endure, or don’t, is a question that is becoming increasingly important to us as a species. About the petroglyphs of the area, Lippard writes: “The shrines and rock art FOCUS space. Their power is invested in their sites.” Of particularly interest to me was the discussion of altars, as well as figures that the Catholics labeled idols. The influx of the religious so-called kachina cult, and its relationship to the earlier emphasis on water serpents, is also discussed in a thoughtful manner. Many years ago, when the area was less divided by barbed wire and less guarded against trespassers, I had friends take me up to the great ridge which lies like a dragon or dinosaur’s spine against the sky. I saw so many petroglyphs, images from long ago that still seem to mark the landscape and give it both emotion and meaning. I saw a big tarantula scurry into its hole and ravens against the turquoise sky. Although I haven’t been back, Lippard’s book took me there again. The photographs by Edward Ranney are beautifully evocative, understated, but luminous. Between text and image I felt I could trespass on the Galisteo Baisin one more time, only lightly, without leaving my footprints. This entry was posted in Uncategorized and tagged Down Country, Galisteo pueblos, Lucy Lippard, Santa Fe archeology, Tano of the Galisteo Basin by Miriam Sagan. Bookmark the permalink.